With a bit of will, every bike is a touring bike. Whenever a distance has to be covered, the KTM owners in OVERDRIVE instantly look at each other, mental cogs whirring on where to plan the fuel stops and when to grab lunch. And these are far from comfortable machines. Point is, long distance biking is huge fun, and in the past few years, also big business for the manufacturers. Adventure bike sales are booming, especially so with the new age 'adventure touring' bikes that would prefer to keep both wheels on the blacktop. Or in this case, at least one wheel. Meet the Versys 1000, a motorcycle that builds on the ultra successful formula of the Versys 650 but with a potent litre class four cylinder pinched from the. Ask a lay person to describe an adventure bike and the first word they would probably use is tall. And so it is with the Versys, a bike that had my 6'1" frame on the toes to get it off the main stand. But the intimidation simply disappears once you start rolling. Even at walking speeds, it feels super stable and confident to filter through traffic. Which was a good thing because I also immediately found myself in a jam filled with Pune's notoriously terrible motorists. The Versys felt completely at ease, its height giving me a great vantage point while the upright position and sensibly set pegs felt completely natural. It also has the lightest clutch pull I've ever experienced on a big bike, as friendly as your average 150cc commuter. 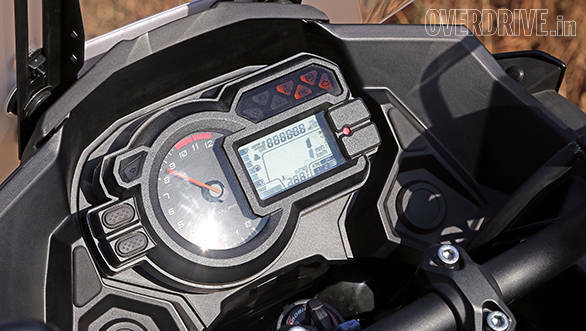 With time to kill, I began playing with the digital display using the toggle switch on the handlebar to find that you have two power modes and three levels of traction control which can also be turned off. The dials give you all relevant information including two trips, a clock, overall and real time efficiency and a distance to empty readout. The only omission was a gear position indicator. 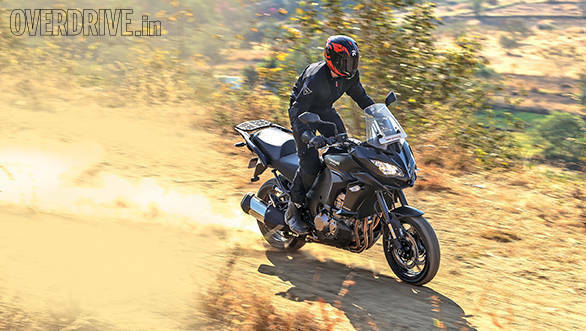 At first the Versys doesn't attract a lot of attention, probably because of the black paint scheme, which by the way is the only one you can have in India. But it does turn a lot of heads particularly because of the shock value of the design which features a Ninja face on a high set semi fairing. The rear stands out too with a wide luggage rack that's suspended high over the fat 180-section rubber. It's not a pretty design but it has plenty of shock value and the bike should look striking in Kawasaki green or that flashy orange shade this bike features overseas. Finally the traffic thinned, a highway appeared and an open stretch ahead begged for throttle to meet the stop. What was a doddle in the city with perfect fuelling and a gentle demeanor suddenly turned into a manic sportsbike. Forget the fact that Kawasaki has reduced compression on this 1043cc engine and forget that its 120PS is 22 down on the Z1000. This bike is massively quick. The engine comes alive post 4,000rpm and begins to scream above 6,000rpm. Hard first and second gear acceleration sees an angry flurry of the traction control light with the system working overtime to keep the rear wheel in line and the front down. First gear is good for just under 100kmph and by third you've already reached some unmentionable speeds. The only difference is that the fun ends at 10,000rpm rather than a superbike's manic 14,000 plus rpm redline which is a bit of a shame because the engine feels like it has even more to give. Nevertheless, it's still the full experience with a spine tingling howl from the exhaust and massive pull at the shoulders. The Versys is fast enough to get you into serious trouble in the blink of an eye. Like when an unassuming street dog decides to amble across the road and you put all your faith in the twin front disc brakes to ensure you both make it to the other side. 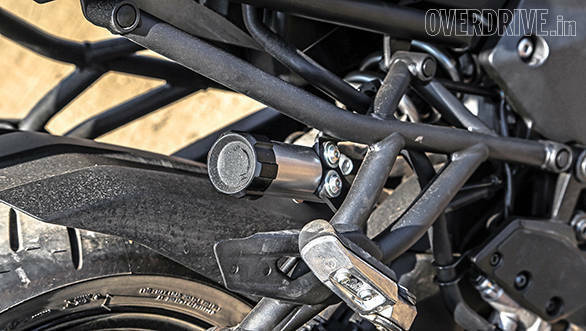 As I felt the powerful Tokico callipers bite down hard and the slipper clutch smooth out my hurried downshifts, I had my first taste of the other side of this motorcycle - fork dive, aka a soft chassis. 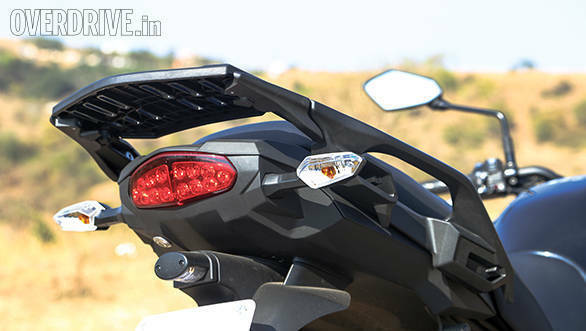 The Versys has been purpose built to eat up huge servings of kilometres. Hence the comfortable riding position, a soft seat that's wide and long enough for at least six of your typical Splendor tandem riding individuals and soft suspension that soaks in everything the road throws at it. You can ride through seriously poor roads without a care and even the worst of potholes will only cause a slight hop at the rear. Highway composure is rock solid and the adjustable windscreen, even at its lowest setting, provides the right amount of wind protection without causing any helmet buffeting at 100kmph. The issue with the softness creeps in once you start attacking corners. The bike doesn't feel completely glued in and the greasy Bridgestone Battlax T30 tyres didn't aid confidence. I added a bit of preload at the rear via the remote adjuster and it improved things but you're still left with the impression that the Versys isn't quite as happy around the bends as say a Ninja 1000. Of course the Ninja has a different chassis set-up with a shorter wheelbase, less weight and more aggressive suspension geometry. 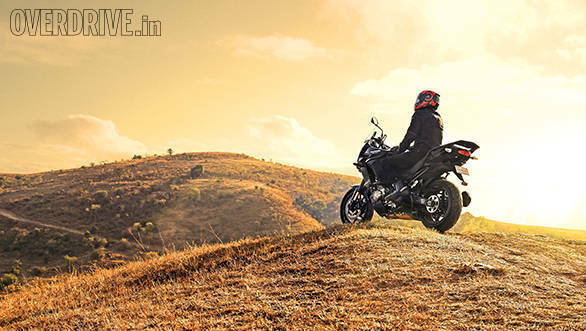 Off-road rideability is decent thanks to the ground clearance but the standard 17-inch wheels wrapped in sportbike sized rubber don't give the 250kg bike a very confident feel in loose dirt. After half an hour of mucking about for photographs, both the Versys and I were happy to be back on tarmac. Post shoot, Varun hopped on the back for a ride and couldn't get over how comfortable the rear seat was. We were heading back to Pune through traffic but the Versys didn't seem to mind, pottering along in sixth gear at just 30kmph. It truly is a versatile machine that perfectly lives up to its name. It has the kind of explosive performance you'd expect from a litre class machine but is also a big softie that will keep you and a pillion in absolute comfort. Its the motorcycle you graduate to from a superbike when you want to sit up and tour the world in comfort but aren't quite ready to let go of the performance envelope. 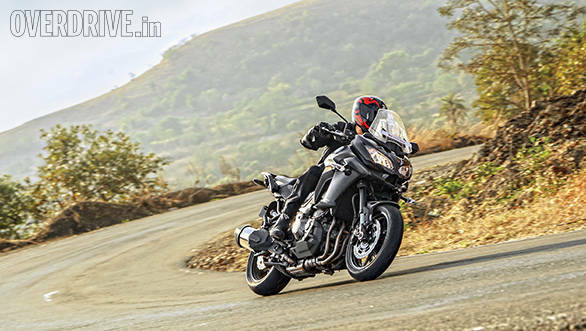 For Rs 14.3 lakh on road in Pune, the Versys makes for quite the compelling sport tourer because it works so well in our conditions. Now we just can't wait to take it on a long ride with more of its kind.